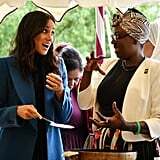 We all like to turn to our favorite brands when we want to feel our best, and Meghan Markle is no different. 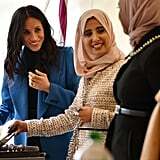 On Sept. 20, the Duchess of Sussex hosted a very special luncheon at Kensington Palace to celebrate the launch of her charity cookbook, Together: Our Community Cookbook. 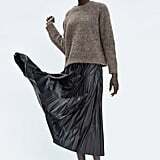 For the occasion, the 37-year-old wore a demure $250 pleated skirt by Misha Nonoo, one of her go-to designers. 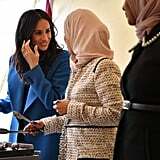 Meghan paired the ladylike design with a simple black turtleneck from Tuxe, a pair of black Sarah Flint pumps, and a gorgeously regal coat from Smythe. 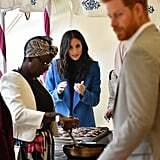 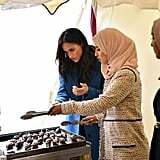 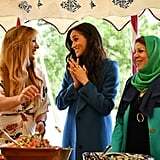 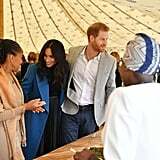 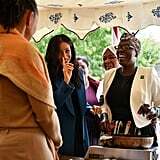 While the duchess did look as stylish as ever, her understated ensemble was perfectly suited to the occasion, which celebrated a community in West London that came together following the devastating Grenfell Tower fire. 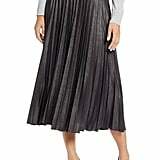 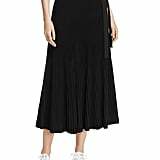 Read on to get a closer look at Meghan's outfit, then shop her exact skirt for yourself.